Welcome to The Indoor Golf Academy - Sheffield's number 1 Indoor Golf venue. With the latest, state of the art golf simulators you can experience the real thing, indoors! 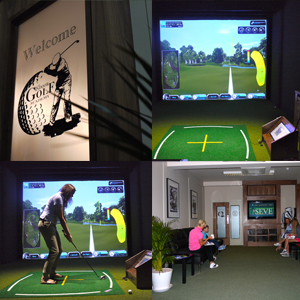 The Indoor Golf Academy are the leaders in indoor golf and corporate entertainment! At the Sheffield Academy we believe it's the ideal place to learn, improve and enjoy your golf. We have all the latest technology to help the pupil get the most out of their golf lesson. A private facility that offers a noise free environment, where personal and professional attention is guaranteed. All parts of your game can be taught / assessed from the full swing, short game, putting and golf fitness with our resident Pro using GASP computer technology and weight pressure monitor systems. Made to measure clubs are available for golfers of all abilities, from beginners to single figure golfers.